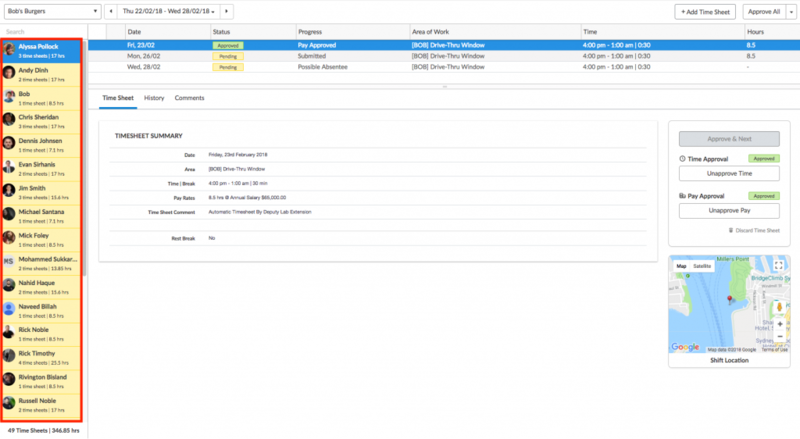 This guide is a general overview of the timesheets function in Deputy. Timesheets are the records of a shift that has been worked. They can be created by an employee clocking on and off, a manager manually creating them, or generated from the roster. An employee may also manually submit one, assuming you have enabled the permission to do so. Each option will be explained below. 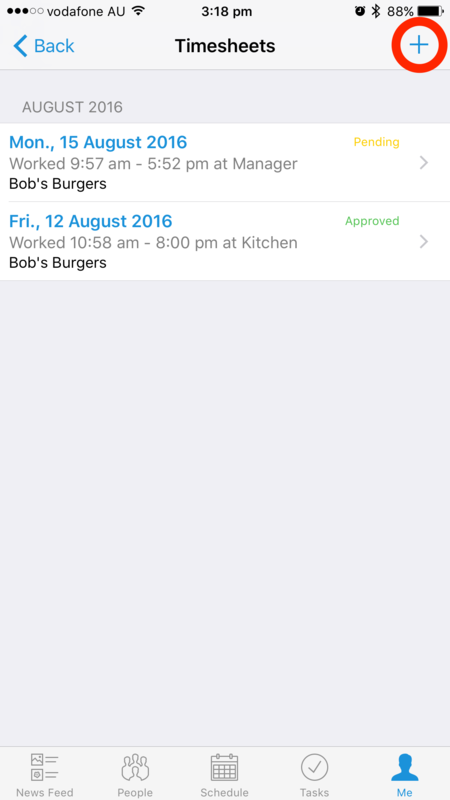 Timesheets are exported to your payroll system after approval to pay your employees. Manually submitted by an employee, if allowed. When an employee uses the apps or the web to clock on the system will capture the exact time they do so, which will later appear on the timesheet. For the timesheet to be successfully created via clocking on, the system will need at least a start time. 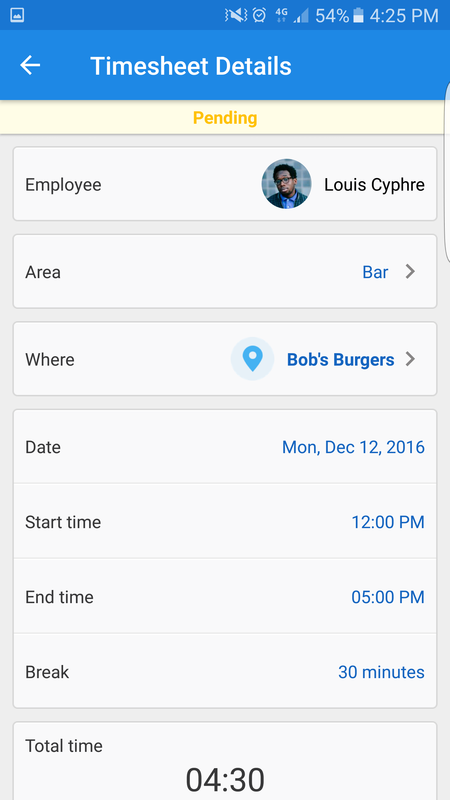 If using the mobile apps, the system will register the start time as soon as an employee clocks on. The Kiosk app will do the same unless the iPad is offline, in which case the timesheet will be created when it connects to the internet. Please note that if the system does not receive an end time within 23 hours (the employee forgets to clock off or Kiosk is still offline), the shift will be rounded to the same as the rostered shift duration from the start time. If you have an 8 hour shift rostered from 9am-5pm, an employee who clocks on at 8:50am but doesn't clock off will show an end time of 4:50pm. You can find more information on rounding here. 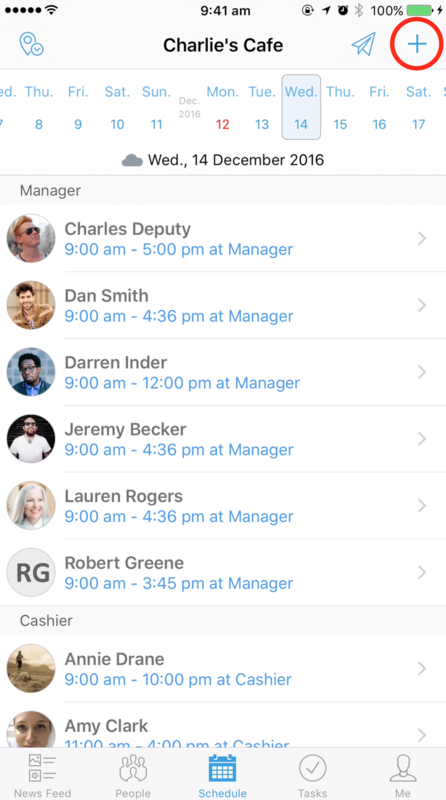 A user who has Supervisor access or higher is able to manually create a timesheet for an employee. To do this, navigate to the 'Approve Timesheets' page. Once you're there, please click "Add Timesheet" in the top right. After doing so you will be asked to select an employee and date for the timesheet. 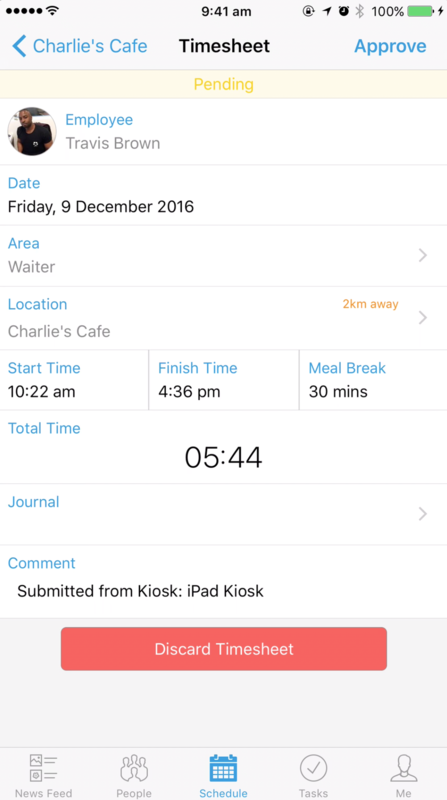 Alternatively, you may also manually create timesheet from the iPhone app. To do this, navigate to the Schedule page and click the + icon in the top right-hand corner. Note: You can only do this when viewing past dates. After you tap the + icon, the following list of options will appear. Select 'Add Timesheet'. After selecting 'Add Timesheet', you will need to add the details of the timesheet. This includes the employee you are creating a timesheet for, the date, area, location, start and end times, meal break, journal notes and any comments about the shift. 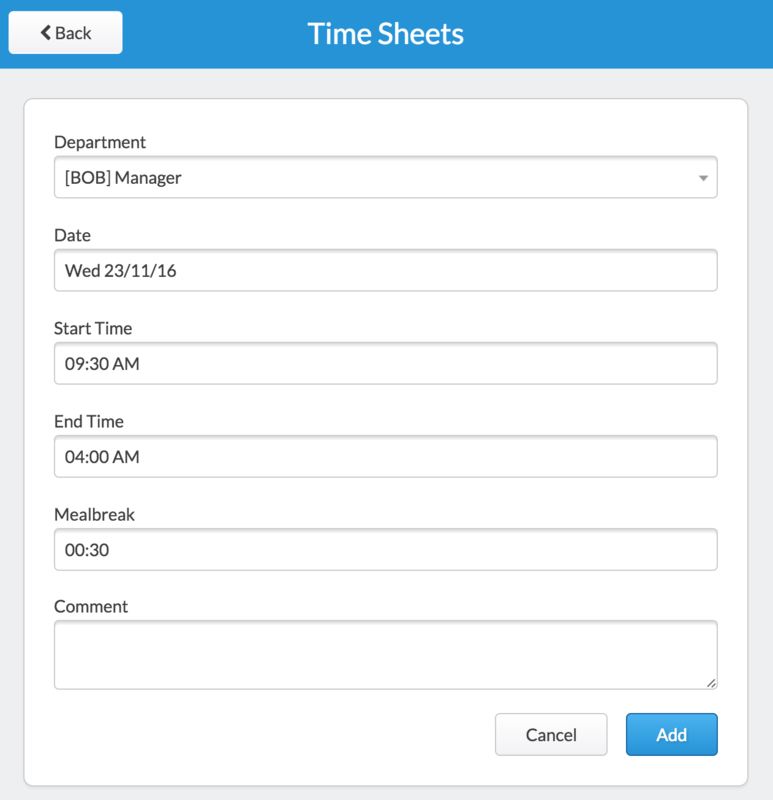 If you have scheduled shifts in Deputy, the system will automatically generate timesheets for you as that day passes. Timesheets will be generated in this manner as long as they were scheduled ahead of time and had an employee assigned to them. This will occur regardless of whether or not the shift has been published. 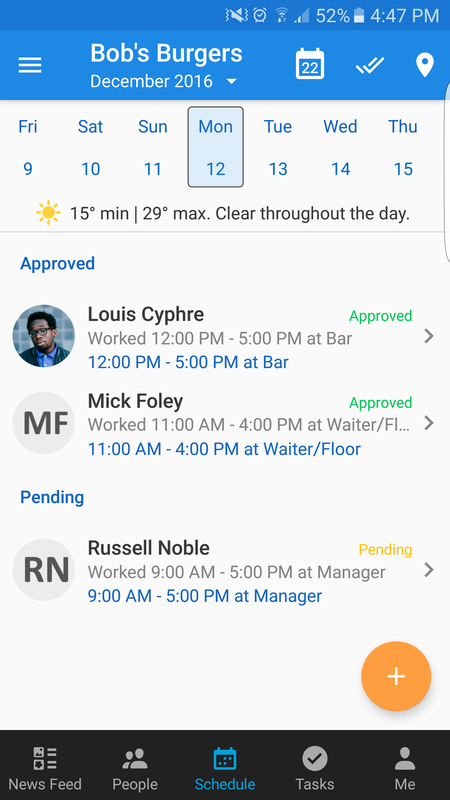 An employee may manually submit a timesheet from their profile page or from the smartphone app, assuming that they have been allowed to by a manager. To submit the timesheet from the website, the employee must first login, then go to their profile in the top right corner of the screen. From there, they may scroll down to their timesheets section where they will see the 'Add New' button. From here, the employees can enter ad-hoc timesheet details. Instructions vary for the smartphone apps. 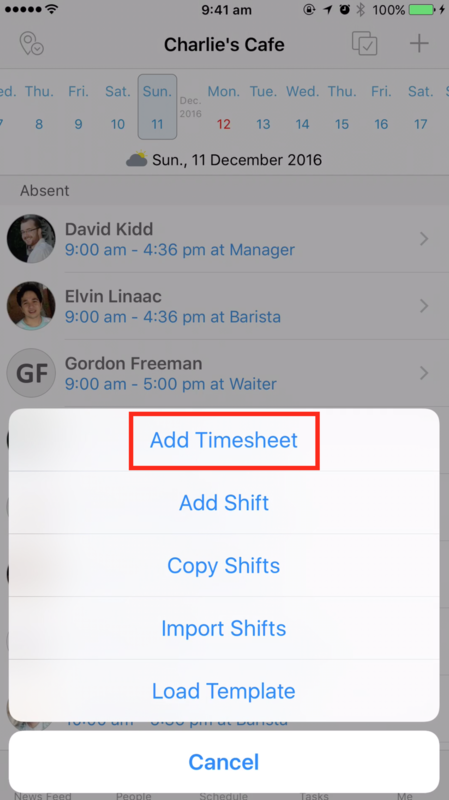 For iPhone, the employee must go to the Me tab, then to "Timesheets". From there they will see a + symbol in the top right corner of the screen. Tapping it will allow them to enter a timesheet. For the Android app they must go to the Shift tab, where they will see a + symbol in the top right. Tapping it will allow them to enter a timesheet. Where Can I Find Timesheets? 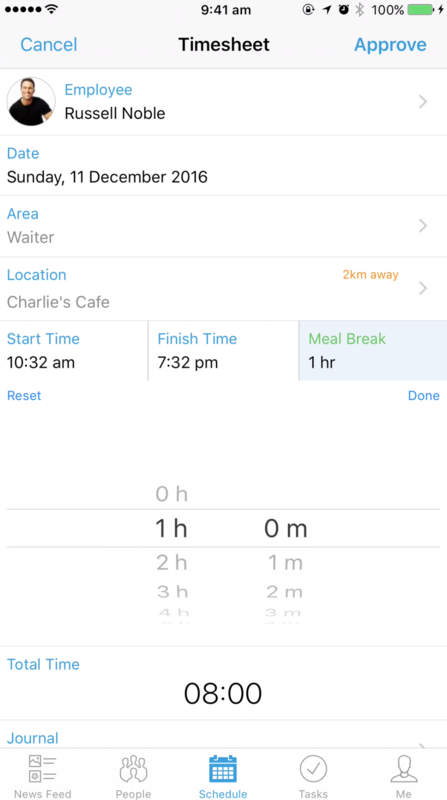 You can find Timesheets by clicking the "Timesheets" tab on the Navigation Bar at the top of your screen. 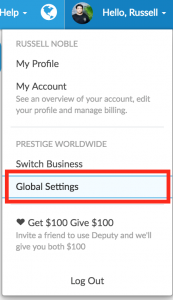 You will see two options, "Approve Timesheets" and "Export Timesheets". To find the Approval section, please click "Approve Timesheets". 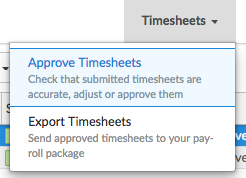 The instructions for exporting your timesheets vary depending on your payroll system. You can find a list of articles here. 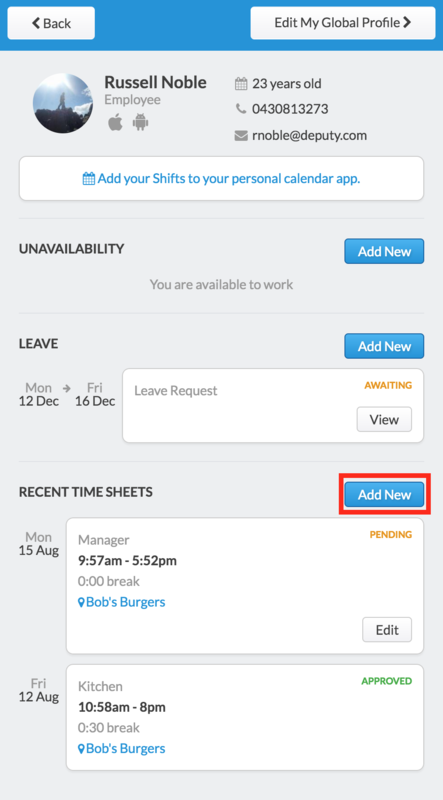 Once you're on the timesheets screen you'll need to use the location and date selectors found in the top left corner. Timesheets will only appear for the selected date range and location, meaning that most of the time if you can't find a timesheet one of the two may be incorrectly set. If you are looking for a specific employee you may use the search function (found below the selectors) to enter their name. 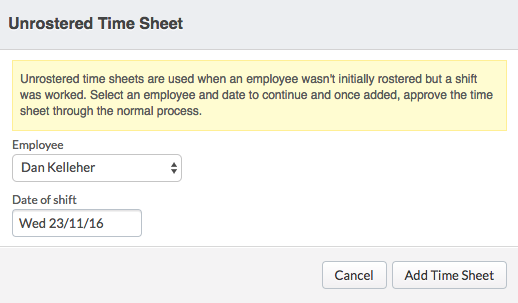 Selecting an employee will display all of their timesheets for the chosen date range and location. If you can see a lightning bolt symbol next to a given timesheet, it means the timesheet was automatically rounded or paid. For more information on this please see here. To approve a timesheet for an employee, you'll first need to click it on the list of their timesheets. Doing so will display the details of that shift; this includes the start time, end time, break and the area of work. On the right you will see a map displaying the workplace. 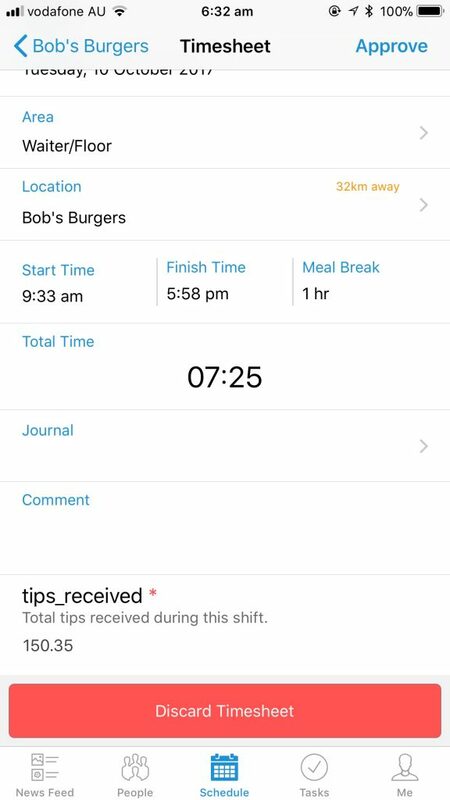 If the employee clocked on using a mobile app you will see a green pin where they clocked on, making it easy to determine whether or not the employee was at work. If you are using the Kiosk without photo verification you'll see only the workplace displayed. If you do have photo verification enabled, you will instead see the employee's photo. If you need to change any of the sections on a timesheet you may freely do so by clicking that section. Doing so for the area of work will display the various areas of the locations you have access to. If you wish to make this timesheet a leave timesheet you can find the full list of leave options at the very bottom of that list.If you wish to pay an employee only the rostered hours you may select "Import Scheduled Details" on the right. When clicking in the fields for the start, break, and end times you may either select one of the preset options or alternatively may type in a figure of your own. After you have edited the fields please click the grey "Approve" option at the bottom. Doing so will prepare it for payroll. You may also click the blue "Approve and Next" option to the right. 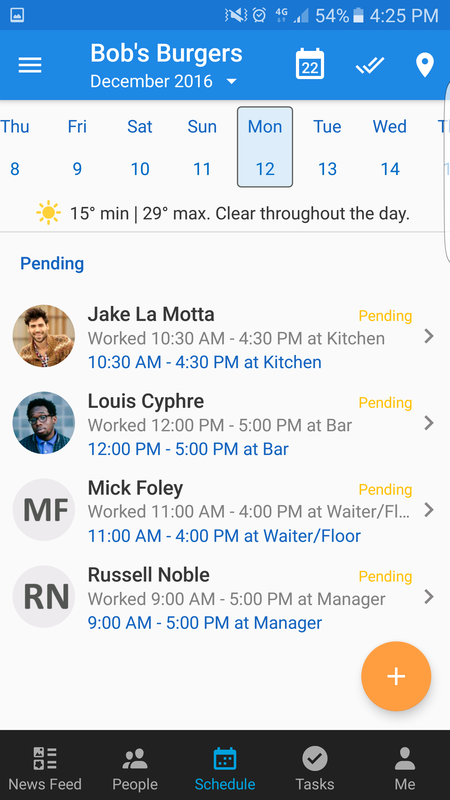 Doing so will take you to the next timesheet for the chosen employee, or if it was that employee's final timesheet will take you to the next employee with a timesheet. If you would like to discard the timesheet from the list, you may do so by clicking the red discard at the bottom of the timesheet. Note that when approving timesheets, you should always do so in chronological order, approving timesheets starting with the oldest date to the most recent date. This will ensure that all overtime and shift loading calculations are accurate. Anytime you edit a timesheet and there are previously approved timesheets for the same employee on a more recent date, you should unapprove and re-approve all timesheets after the date on which you made the edits. First you will need to find the timesheet. This is done by finding the relevant day on the schedule tab, then looking through the list of timesheets for that day. You will see the employee's scheduled time, as well as their actual worked time. 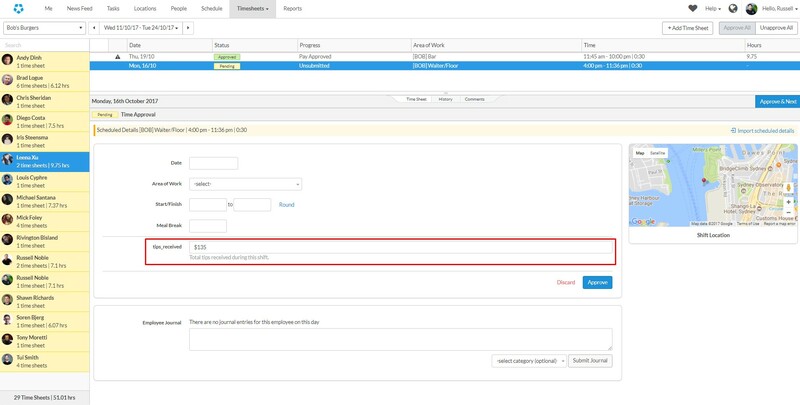 Please click an employee's tab to open their timesheet, which will allow you to edit it by entering the start, break, and end time details; you may also enter a journal and comment in the displayed tabs. After you have finished editing the details, please click "Approve" in the top right corner. 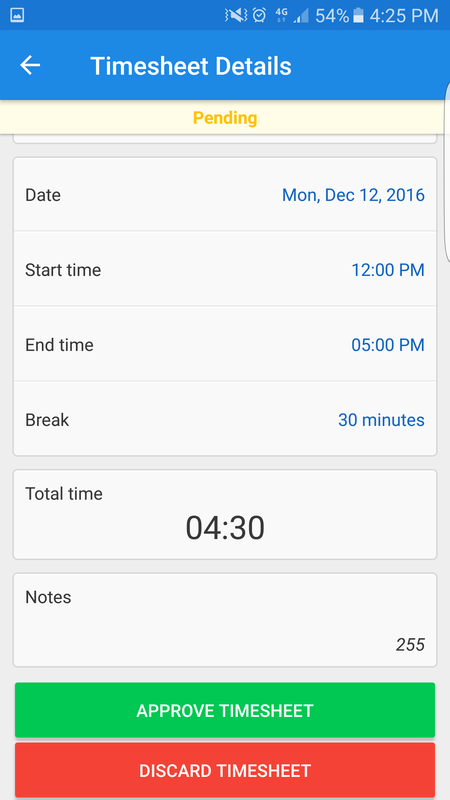 Approving Timesheets on the Android app is easy. Simply head to the Schedule tab. Here you will see timesheets that are pending, as shown in the image below. Simply tap the shift you would like to Approve. On this page, you can edit the details of the timesheet. Ensure that all the details are correct, and make any corrections where necessary. When all the details are correct, scroll to the bottom and tap Approve. 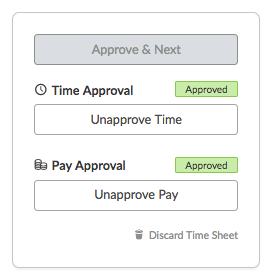 Timesheets will now be marked as 'Approved' on your Schedule page. Discarded timesheets will be removed from the Schedule page. Bulk approving employee time sheets can yield significant time savings, especially for employees on salary, or when an employee is known to have worked their roster hours. Note: Timesheets with the 'Progress' state of 'Unsubmitted' cannot be bulk approved. 1. You may perform a quick check using the Time and Hours columns for the employee's time sheets. 2. If there are no anomalies, click the Approve All button located at the top right of the Approve Time Sheets window. 3. All submitted time sheets are now approved. Note: To approve 'Unsubmitted' time sheets, manually select each time sheet and fill in the shift details. If the shift wasn't worked you can also discard the time sheet. Now click the 'Misc' tab, then click 'Timesheet Custom Fields'. In the image above, we can see the employee is working in one of the areas selected previously. In the image, the tooltip help text also appears under the custom field. 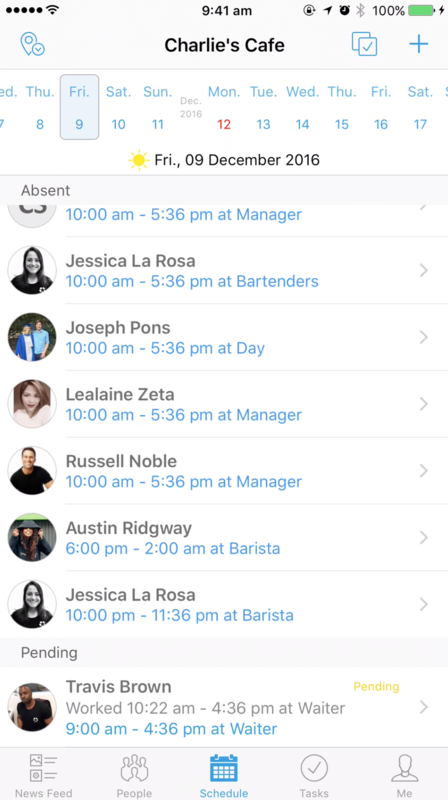 To enter a value in a custom field, head to the Schedule tab on your iPhone, then tap an unapproved timesheet. Scroll to the bottom to find the field. There may be a time where a submitted timesheet needs to be amended. To do this, simply head to the 'Timesheet Approval' page. Then head to the approved timesheet. On the right side of the page (above the Kiosk photo/geolocation pin), you will see the following. Click the option based on what you need to amend. The timesheet will become 'Open' again. Amend any details, then click 'Approve & Next' when you are done. On the timesheet tab, you may also view any comments left by an employee or other managers. This is done by clicking the Comments tab near the centre of the screen as shown. You may also view a full history of any changes made to the selected timesheet by clicking the History tab in the centre of the screen. For more information on the History, please see here.